Omkareshwar is located in central India therefore the temperature difference between the different seasons is quite large. However, many tourists prefer to visit this city in the winters, citing the welcoming cool temperatures. 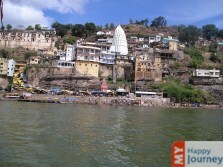 Omkareshwar is located in the state of Madhya Pradesh, which is in the center of the country. This region is known for its intense extremes of weather, so tourists are advised to be prepared accordingly. The winter season from the month of December through to the month of February is ideal for those tourists coming to the city to participate in the kind of tourist activities they want to. These visitors should make sure that they are carrying the right amount of protective clothing against the cold since sometimes temperatures do dip to sub - zero levels. Visiting Omkareshwar in the summer season is not recommended for tourists since the heat during the summers, from March to May, can be a little too intense even for the local residents who are used to it. Tourists, especially those who are not accustomed to such temperatures should avoid visiting. The monsoons start in June and end in September, also severely limiting any prospects of going outdoors. The winters in Omkareshwar go on from the month of December to the month of February. These months attract a large number of tourists thanks to the rather pleasant weather which forms the ambience of the city and the surrounding areas. From March all the way up till May, Omkareshwar’s summer season is known for its intensity. Tourists who wish to partake in any form of outdoor travel should not plan any such excursions since going out in such heat, especially without preparation can be quite unpleasant. From the month of June to the month of September, the monsoon season comes to Omkareshwar, putting an effective stopper on any plans involving going outside which tourists might have made. Very Cold This month is great for tourists to visit since the temperature in and around the city lower down to levels which makes any outdoor sightseeing trips a great deal more enjoyable, thanks to the mild sunshine in the day and the chilly breezes at night. This month is the best for tourists who are looking for the ideal vacation. Moderately Cold The day time temperature throughout February also remains slightly chilly, with the days being mildly warm, with balmy sunshine and the night time mercury plunging thanks to a cool breeze. This month is also extremely popular among tourists who want to go out and do some sightseeing. Moderately Warm Throughout this month, there is a transition from winter to summer. The natural beauty of Omkareshwar is something which begins to invite tourists, but the rising temperature means that tourists should carry adequate protection against the effects of the sun. Towards the end of the month, the climate transitions to the summer season. Hot The summers in Omkareshwar are rather intense, therefore making a visit to this city is advisable only for those tourists who are either well equipped to handle the rising temperatures which at times push beyond 40Ãƒâ€šÃ‚ÂºC. Light and loose clothing, coupled with sunscreen is highly recommended, given the intensity of summer in this region. Very Hot Visiting Omkareshwar in the month of May is recommended only to those tourists who are sure that they can withstand the extremely hot weather during this month. Strong sunlight, clear blue skies and hot winds sweeping throughout the region can make any outdoor tourist experience most unpleasant, especially for those tourists who are not prepared for it. Very Hot This month is also intensely hot, like the one before it, but the monsoon season begins moving in towards the end of this month. This means that there is a marked rise in the levels of humidity here, which can often lead to days across the month wherein the combination of these temperatures and rising humidity can make outdoors unbearable for many tourists. Rainy The monsoon season begins sweeping across Omkareshwar in this month, with intense rains which pour from the skies, bringing down temperatures and raising the humidity in the air. The initial few days of the month are known for their combination of heat and humidity but the intense rains lower the temperature later on. The rain however, will play a definite spoilsport in any outdoor tourist plans. Rainy The monsoons or the rainy season continue to be in full force during this month, with August being one of the rainiest months which tourists visiting the city will get to experience. This rain makes outdoor travel, sightseeing and other tourist activities extremely troublesome for those tourists who are not acclimatized to the intensity of the monsoon season in this region. Pleasant The monsoon rains begin to fade away throughout this month with the intensity of the rains as well as the frequency continues to reduce. By the end of the second week, Omkareshwar's natural beauty begins to come through as the post rain flora begins to take on a fresh new appearance thanks to the departing monsoons and the bright sunshine that follows. Pleasant This month is also fairly warm once the monsoons leave. There is plenty of humidity in the air which can make the temperatures seem a lot higher than they really are. The days are hot and humid but the night time temperatures are rather pleasant. Temperatures continue to slowly decrease across the month, making outdoor activities feasible for tourists. Moderately Cold The mercury continues to dip, with the days having bright but not harsh sunlight. Night time temperatures border on chilly, especially with the occasional breeze during this month. Tourists who want to go outdoors can most definitely go out and enjoy the tourist activities they wished to indulge in throughout this month. Very Cold The winters in Omkareshwar are a definite tourist's delight since the day time temperatures become delightfully cool as the mild sunshine illuminates the day. For night time, tourists are advised to carry warm woolen clothing during their visit. This month is a great time for tourists coming to Omkareshwar to indulge in the sightseeing and nature trips they wanted.